If you’re looking for a midsize sedan that will give you the comfort and space you need at a reasonable price, then you’ll want to check out the 2017 Chevrolet Malibu near Clio, MI at Patsy Lou Chevrolet in Flint, MI. Kelley Blue Book praises this model’s “modern and comfortable interior,” and we have to agree. Take a full tour of the interior of the 2017 Chevy Malibu with us here, and then come by our dealership to take it for a test drive. The interior of the 2017 Chevy Malibu has been designed to offer up the most comfort and style for an affordable price. This midsize sedan can comfortably seat up to five adults, and it has a total interior volume of 118.7 cubic feet. You’ll also get plenty of room for storage inside the trunk, which measures 15.8 cubic feet. All models are ergonomically designed and fitted with plenty of soft-touch materials, and if you move up to the top of the trim ladder then you’ll be able to access soft leather upholstery for all five seats, as well as heated and ventilated front seats. Beginning with the LS trim, you’ll also get laminated side windows and windshield helping create a quieter riding experience even at highway speeds. Dual-Zone Automatic Climate Control – Every Malibu comes with air conditioning, but the Premier trim gets dual-zone automatic climate control, allowing the drive and front seat passenger to set the temperature for their own parts of the cabin. 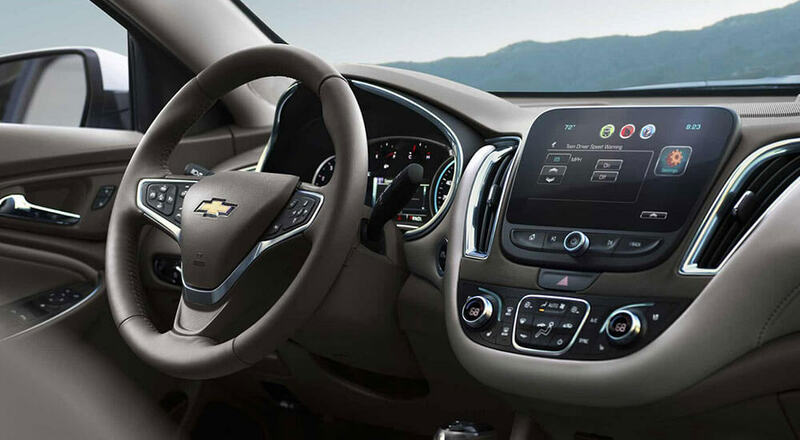 Go Keyless – Every Malibu comes standard with keyless entry and push-button start, letting you keep your keys in the pocket while you step inside and start the engine. Power Front Seats – Set your seats to the preferred settings with power adjustability up front. The premier trim also comes with memorized driver settings, which automatically switches the settings based on who’s behind the wheel. We have the full 2017 lineup of new Chevy Malibus right now at Patsy Lou Chevrolet, located near Clio, MI at 5135 Corunna Road in Flint, MI. Stop in and see us Monday through Saturday, and contact us at (810) 230-4123 if you have any questions!